Ultrathin notebooks, such as the Apple MacBook Air, can be so thin that even a standard 2.5-inch SSD would not be able to fit properly inside of the case. Now with the advent of Ultrabooks attempting to go mainstream, the mSATA market may be about to boom. California-based manufacturer OCZ will be extending its mSATA lineup with the Deneva2 30GB and 60GB SSDs, both of which have been tested and certified for Intel Ultrabook use. 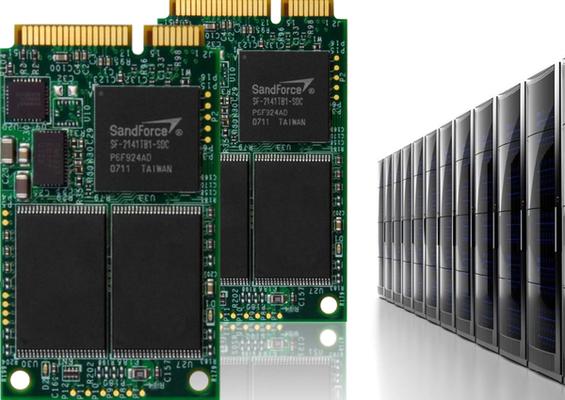 According to Tom's Hardware, these SATA II SSDs will be using SandForce controllers with a throughput of over 280MB/s and support for TRIM. The drives may be used in combination with HDDs due to the low capacity of the Deneva 2 SSDs. We expect these OCZ drives to make an appearance in a number of 2012 Ultrabooks. SAN JOSE, Calif., Jan. 4, 2012 (GLOBE NEWSWIRE) -- OCZ Technology Group, Inc. (Nasdaq:OCZ), a leading provider of high-performance solid-state drives (SSDs) for computing devices and systems, today announced that the OCZ Deneva2 30GB and 60GB mSATA SSDs, part numbers D2CSTEMS1A10-0030 and D2CSTEMS1A10-0060 have been tested with Intel® Smart Response Technology and have passed the performance benchmarks for the 'While Using' portion of the responsiveness requirements in the 2012 Ultrabook™ Definition. "We are pleased with the results that Intel has achieved with our Deneva 2 mSATA products," said Tobias Brinkmann, VP Partner Relations at OCZ Technology Group. "The Deneva 2 SSDs have a very small footprint making them ideal for the slim and stylish Ultrabook™ designs, and also deliver exceptionally fast bootup and data transfer speeds for a superior instant-on and overall more responsive computing experience." Intel Ultrabooks™ combine best-in-class performance, responsiveness, and security in thin and light elegant form factors, and make use of only certified SSDs to provide a faster, more energy-efficient option than mechanical hard disk drives (HDDs). OCZ Deneva 2 mSATA solutions are significantly slimmer than traditional 2.5-inch storage devices, enabling the Ultrabook™ to support low-profile dimensions less than 21mm thick without compromising on storage capacity, speed, or battery life. Additionally, Deneva 2 mSATA SSDs offer industry-leading performance and endurance for this mobile powerhouse. The Ultrabook™ Series and Intel's ultra-low voltage second generation Intel Core™ processors provide a platform for SSDs to shine and enable maximum productivity and multimedia enjoyment. Deneva's ability to provide a custom-tailored solution ensures superior cost efficiency, functionality, and compatibility that other SSD lines cannot deliver. Disclaimer: Intel® Smart Response Technology requires a select Intel® processor, enabled chipset, Intel® Rapid Storage Technology software, and a properly configured storage solution (HDD + small SSD). Depending on system configuration, your results may vary. Contact your system manufacturer for more information. Founded in 2002, San Jose, CA-based OCZ Technology Group, Inc. (OCZ), is a leader in the design, manufacturing, and distribution of high performance and reliable Solid-State Drives (SSDs) and premium computer components. OCZ has built on its expertise in high-speed memory to become a leader in the enterprise and consumer SSD markets, a technology that competes with traditional rotating magnetic hard disk drives (HDDs). SSDs are faster, more reliable, generate less heat and use significantly less power than the HDDs used in the majority of computers today. In addition to SSD technology, OCZ also offers high performance components for computing devices and systems, including enterprise-class power management products as well as leading-edge computer gaming solutions. For more information, please visit: http://www.ocztechnology.com/www.ocztechnology.com.